I have had my say before about the consumerism connected with holidays. Why must we buy, buy, buy for holidays? Why must every holiday be a marketing ploy to get as much candy bought and sold and consumed by children? If we look back in history it was not that way. People made gifts that were appreciated far more by their loved ones. 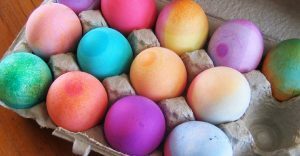 We gathered the family together and colored and painted Easter eggs with each others names on them. We hunted Easter eggs, had egg rolling contests and there was even a dance that was performed around all the colored eggs on the floor trying not to land on them. What can we do to bring back holiday fun without all the candy and consumerism? Gathering together with friends and family for a nice meal and some games and dancing sounds like a good start to me!